← Blood oranges are in….. 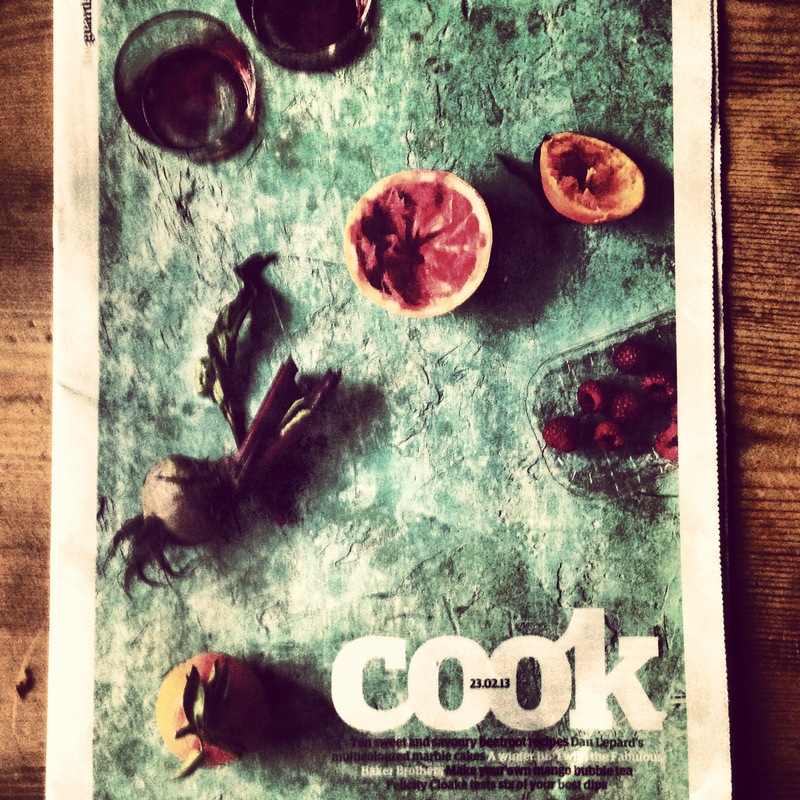 Yesterday this recipe of mine was printed in the new ‘Cook’ magazine in The Guardian. It’s bloody good…. Easy peasy. A brilliant and gorgeous, magenta puree. How to elevate a vegetable to the heights of celebrity. Simple and cheap too. Great as a dip, to pass around with drinks with warm blinis or cubes of dark (almost chocolaty) rye bread or good crusty bread or toast. Makes plenty enough to feed 8-10 people as a dip. 1. Preheat oven 200 C/400 F/ Gas 6. Scrub the beetroot really well place in a roasting tin or oven proof dish, cover and place in the oven 45 minutes-1 hour or until tender. Leave to cool. 2. Tip the walnuts onto a tray and toast for 5-8 minutes or until just golden. Tip onto a plate and leave to cool. 3. Chop the prunes finely and place in a small bowl. Pour the brandy into a small pan bring to a boil, carefully ignite and when the flames have subsided, pour over the prunes and leave to soak for about 30 minutes. 4. Squeeze the juice from the lemon and grind half of the walnuts until fine in a food processor. Crumble or finely chop the remaining walnuts. 5. When the beetroot are cooked and cool enough to handle, peel them and chop roughly and tip into the bowl of the food processor. 6. Peel and crush the garlic and add to the beetroot with the soaked prunes and whiz until the beetroot is very finely chopped but not quite pureed. 7. Scrape the beetroot into a bowl, season to taste with salt, pepper and about 2 tablespoons of the lemon juice, adding more to taste. 8. Warm the blinis, in the oven for 2-3 minutes, if using or cut the bread into cubes. 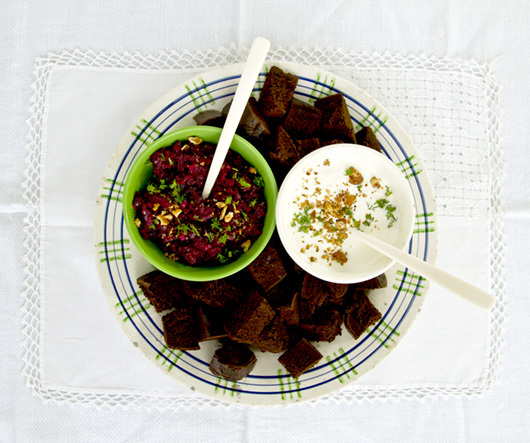 Serve the beetroot caviar in a small serving bowl. Chop the dill and sprinkle over the sour cream, then sprinkle with the remaining walnuts. Serve the warmed blinis or cubes of rye bread or toast on the side. Pass around and let everyone help themselves. This entry was posted in August, December, Drinks & Nibbles, July, June, November, October, Recipes, September, Starters, Vegetables, Vegetarian and tagged beet, beet recipes, beetroot, beetroot dip, beetroot puree, beetroot recipes, beets, dips. Bookmark the permalink.